The Tampa Bay Lightning signed forward Niklas Persson to a one-year, two-way contract today, Vice President and General Manager Steve Yzerman announced. Persson, 6-foot-2, 205 pounds, spent last season with Nizhnekamsk Neftekhimik of Russia’s Kontinental Hockey League, recording 13 goals and 38 points in 55 games with a plus-14 rating. He also contributed four power-play goals and one game-winning goal. Persson led the team in assists, points, average time on ice among forwards with 16:55 and was tied for the team lead for plus/minus rating. He was also tied for second in power-play goals and seventh for goals. A native of Ösmo, Sweden, Persson has spent his entire career prior to 2009-10 in Sweden, mostly in the Swedish Elite League. For his career he has accumulated 79 goals and 203 points in 458 SEL games with Linkopings and Leksands. Persson had his best season in the SEL in 2008-09, his final season in the league, posting career highs with 21 goals and 42 points in 55 games. During his SEL career he reached the 10-goal mark on four occasions. Persson has also appeared in 43 SEL playoff games, recording 12 goals and 31 points. In 2008-09 he led Linkopings in playoff goals with four and points with eight in seven games. The 31-year-old has also excelled in international competition with his native Sweden. 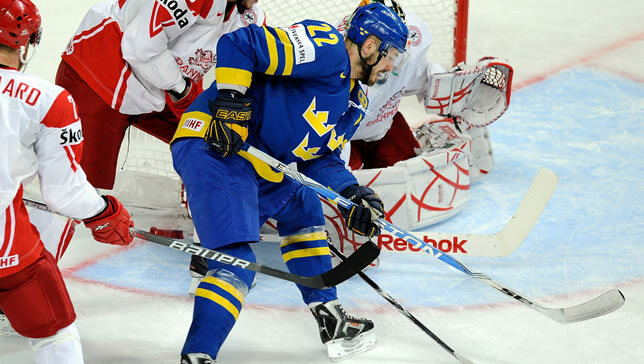 Most recently Persson played in the 2010 IIHF World Championships, where he was second on Team Sweden in ice time with 19:31 and tied for second with four assists. Persson also participated in the 2009 World Championships, notching two goals and six points in nine games. He was also tied for third on the team with a plus-5 rating. Persson also participated in the 1999 and 1998 World Junior Championships. In 1999 he recorded two goals and four points in six games after he registered two assists in seven games the previous year.